The majority of patients with pituitary adenomas present with signs and symptoms reflecting excess hormone production. 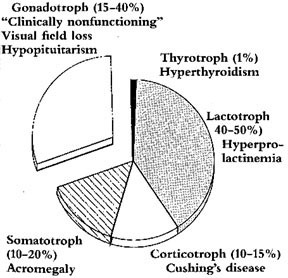 Approximately 25-30% of patients with pituitary tumors do not have classical hypersecretory syndromes such as hyperprolactinemia, acromegaly or Cushing's disease and present as the case described above. These tumors are referred to as clinically nonfunctioning adenomas (see Figure 1) Patients often present with signs of mass effects, including headaches and symptoms of pituitary insufficiency In addition, compression of the optic chiasm frequently results in temporal field deficits Recent progress in our ability to characterize and diagnose these tumors will be discussed here. Case Presentation - MT is a 54 year old male who presented with a chief complaint of recent severe headaches and visual blurring. The history was notable for approximately 6 months of diminished libido and progressive impotence. He also complained of generalized fatigue, mild cold intolerance and decreased appetite. Physical exam was notable for a BP of 105/60, pulse of 60 (with significant orthostatic changes), pallor, bilateral gynecomastia, decreased testicle size at 10 ml bilaterally, the absence of Cushingoid or acromegalic features, and delayed deep tendon reflexes. Laboratory testing was notable for the following: testosterone 150 ng/dl (normal, 300-1100 ng/dl), T4 3-5 mcg/dl (4-12 mcg/dl), THBI 0.73 (0.83 1.17), TSH 10 mU/ml (0.5-5.0 mU/ml), and prolactin 48 (less than 10 ng/ml). A cortrosyn stimulation test showed deficient cortisol reserve with pcak cortisol levcl of 10 mcg/dl. The somatomedin C level was normal. A serum alpha-subunit levcl was elevated at 6 ng/ml (normal less than 2.5 ng/ml). Visual field analysis demonstrated bitemporal hemianopsia. Because of the presence of panhypopituitarism and visual field deficits, the physician ordered a brain MRI which demonstrated the presence of a large sellar mass with suprasellar extension resulting in compression of the optic chiasm. A tentative diagnosis of a clinically nonfunctioning pituitary adenoma was made. Figure 1: Pituitary tumor types. Clinically nonfunctioning pituitary tumors, or gonadotroph adenomas, comprise 15 to 40% of all pituitary tumors Other pituitary tumor types, including prolactinomas, somatotroph and corticotroph adenomas are indicated. Diagnostic and Clinical Issues - Because many patients with clinically nonfunctioning pituitary adenomas lack a specific serum hormone marker, it may be difficult to distinguish these tumors from other intra- and suprasellar non-pituitary masses that may mimic pituitary adenomas in their clinical, endocrinologic, and radiographic presentation The differential diagnosis of such lesions includes craniopharyngiomas, meningiomas, arachnoid cysts, granulomatous diseases, gliomas, metastatic tumors, and chordomas. The preoperative diagnosis of pituitary adenomas has been facilitated by 1) use of serum markers, and 2) gonadotropin responses to TRH. Demonstration of elevated serum levels of glycoprotein hormones and/or free subunit levels, typically alpha-subunit and FSH-beta may suggest the presence of a pituitary adenoma, indicating the utility of such tumor markers. It may be difficult to determine whether an elevated gonadotropin or free subunit level reflects secretion by normal or neoplastic gonadotrophs. For example, free subunit secretion may accompany secretion of intact gonadotropins in patients with primary gonadal failure. This is particularly relevant in the evaluation of a post-menopausal woman with a sellar mass. Therefore, when interpreting levels of serum markers, it is important to consider the clinical setting and assay technique and to compare intact gonadotropin and free subunit levels. Patients with clinically nonfunctioning tumors may demonstrate unique gonadotropin responses following hypothalamic peptide administration in up to 40% of patients, administration of TRH results in stimulation of serum levels of gonadotropins and/or free subunits. These data suggest that TRH receptors, not found in normal gonadotroph membranes, are expressed on neoplastic gonadotroph cells. In a recent study, TRH tests elicited an exaggerated response of LH-beta-subumt in 11 of 16 women with clinically nonfunctioning adenomas and normal basal serum LH and LH-beta levels. There-fore, a TRH test may be diagnostically useful in the evaluation of patients with intrasellar lesions. Clinical manifestations - Because of the lack of clinical manifestations of anterior pituitary hormone excess, tumors may grow to a large size before they are diagnosed The tumors are often first detected when patients present to an ophthalmologist for evaluation of visual changes and visual field deficits are found. Growth of the tumor into the cavernous sinuses may result in cranial nerve palsies. Partial or complete hypopituitarism is frequently demonstrated in patients with large clinically nonfunctioning tumors because of compression of the adjacent, normal pituitary gland. Secondary thyroid or adrenal insufficiency may be detected in 81 and 62% of patients respectively. A 'mild degree of hyperprolactinemia is present in up to 80% of patients and is likely to be produced by the remaining, normal pituitary gland as a result of compression of the hypophyseal stalk by the tumor with loss of hypothalamic inhibitory signals. Clinically symptomatic diabetes insipidus is an uncommon finding at the time of initial presentation in patients with pituitary adenomas, and its presence in association with a sellar and/or suprasellar mass suggests that the lesion may not be a primary pituitary tumor. Hypogonadism is detected in up to 96% of patients with pituitary macroadenomas (> 1 cm) and is usually associated with inappropriately normal or decreased serum gonadotropin levels, indicating central hypogonadism The etiology of hypogonadism in this setting may be multifactorial. In addition to insufficiency of LH and FSH secretion by normal gonadotrophs due to tumor mass effect, patients with such tumors may also have gonadotroph deficiency due to mild associated hyperprolactinemia. Also, these tumors may secrete bioinactive gonadotropin monomer subunits instead of the intact bioactive heterodimers, resulting in inadequate gonadotropin stimulation of the gonads by these subunits. Surgical management of these tumors with resultant reduction in mass effect may result in reversal of the hypogonadism. However, the majority of patients with clinically nonfunctioning adenomas require gonadal steroid replacement. 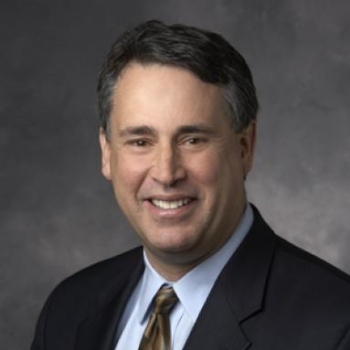 Characterization - Advances in radioimrnunoassav, immunocytochemical and molecular biology techniques have allowed for detailed characterization of clinically nonfunctioning tumors. In vitro studies have shown that the majority of clinically nonfunctioning adenomas synthesize intact glycoprotein hormones and/or their free alpha- and beta-subunits. The glycoprotein hormones include LH, FSH, and TSH and consist of a common alpha-subunit and a unique beta-subunit which confers both immunologic and biologic specificity. Secretion of gonadotropin and free subunits occurs commonly in cultured pituitary tumor cells, with only a minority of tumors showing evidence of TSH secretion. There-fore, the majority of tumors are presumably of gonadotroph origin. 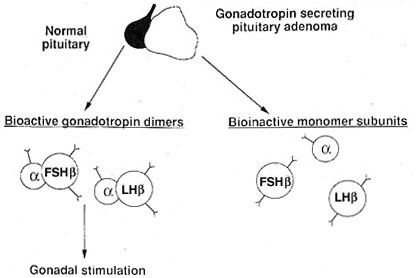 Figure 2: Secretion of gonadotroph free subunits by clinically nonfunctioning pituitary adenomas. The normal pituitary gland secrete intact LH and FSH heterodimers which are bioactive at the level of the gonads. In contrast, clinically nonfunctioning pituitary adenomas secrete the free gonadotropin alpha- and beta-subunits. These free subunits are bioinactive at the gonadal level. In many patients with these glycoprotein hormone tumors, serum levels of LH, FSH, and the free subunits arc normal. However sera from patients with clinically nonfunctioning adenomas may show elevations in FSH, FSH-beta, alpha-subunit, and infrequently LH. Increased serum levels of alpha-subunit, FSH and/or FSH-beta are the most commonly detected Serum levels of FSH may be elevated in up to 50% of patients. Secretion of free subunits is also noted in patients with FSH-secreting tumors and co-secretion of alpha-subunit found in up to 48% of such patients. LH and FSH are often secreted by these tumors as bioinactive free alpha- and beta-subunits (see Figure 2). Pure alpha-subunit secreting pituitary adenomas are increasingly recognized and represent approximately 7% of all clinically nonfunctioning adenomas. LH-secreting adenomas are rare and may be associated with markedly elevated levels of testosterone. In summary, recent laboratory and clinical investigations have led to advances in our ability to characterize and diagnose clinically nonfunctioning pituitary adenomas. The availability of more sensitive and specific glycoprotein hormone free subunit assays may facilitate pre-operative characterization of these tumors. Discussion of management options for patients with these tumors will be included in a subsequent newsletter.